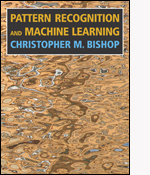 Textbook: Pattern Recognition and Machine Learning, Chris Bishop. Optional textbook: Machine Learning, Tom Mitchell. Ziv-Bar Joseph (email: zivbj at cs.cmu.edu), Gates Hillman Complex 8006, Office Hours: Monday 3:00-4:00pm. Michelle Martin (email: michelle324 at cs.cmu.edu), Gates Hillman Complex 8001. Anthony Gitter (email: agitter at cs.cmu.edu), Gates Hillman Complex 9221, Office Hours: Tuesday 2:00-3:00pm. Hai-Son Le (email: hple at cs.cmu.edu), Gates Hillman Complex 8227, Office Hours: Monday 12:30-1:30pm. Yang Xu (email: yx1 at cs.cmu.edu), Gates Hillman Complex 8010, Office Hours: Monday 4:00-5:00pm. Website maintained by Yang Xu.